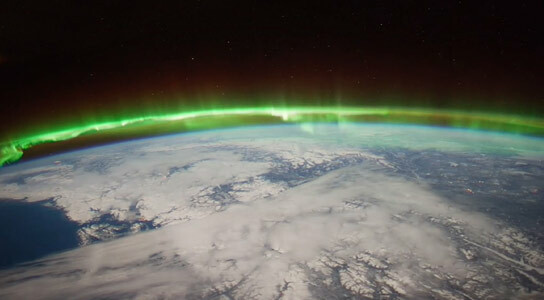 The Aurora Borealis viewed by the crew of Expedition 30 on board the International Space Station. The sequence of shots was taken on February 7, 2012 from 09:54:04 to 10:03:59 GMT, on a pass from the North Pacific Ocean, west of Canada, to southwestern Illinois. New research from scientists at NASA’s Jet Propulsion Laboratory and at the University of New Brunswick looks at irregularities in the ionosphere, comparing turbulence in the auroral region to that at higher latitudes. When you don’t know how to get to an unfamiliar place, you probably rely on a smart phone or other device with a Global Positioning System (GPS) module for guidance. You may not realize that, especially at high latitudes on our planet, signals traveling between GPS satellites and your device can get distorted in Earth’s upper atmosphere. Researchers at NASA’s Jet Propulsion Laboratory, Pasadena, California, in collaboration with the University of New Brunswick in Canada, are studying irregularities in the ionosphere, a part of the atmosphere centered about 217 miles (350 kilometers) above the ground that defines the boundary between Earth and space. The ionosphere is a shell of charged particles (electrons and ions), called plasma, that is produced by solar radiation and energetic particle impact. The new study, published in the journal Geophysical Research Letters, compares turbulence in the auroral region to that at higher latitudes, and gains insights that could have implications for the mitigation of disturbances in the ionosphere. Auroras are spectacular multicolored lights in the sky that mainly occur when energetic particles driven from the magnetosphere, the protective magnetic bubble that surrounds Earth, crash into the ionosphere below it. The auroral zones are narrow oval-shaped bands over high latitudes outside the polar caps, which are regions around Earth’s magnetic poles. This study focused on the atmosphere above the Northern Hemisphere. “We want to explore the near-Earth plasma and find out how big plasma irregularities need to be to interfere with navigation signals broadcast by GPS,” said Esayas Shume. Shume is a researcher at JPL and the California Institute of Technology in Pasadena, and lead author of the study. If you think of the ionosphere as a fluid, the irregularities comprise regions of lower density (bubbles) in the neighborhood of high-density ionization areas, creating the effect of clumps of more and less intense ionization. This “froth” can interfere with radio signals including those from GPS and aircraft, particularly at high latitudes. The size of the irregularities in the plasma gives researchers clues about their cause, which help predict when and where they will occur. More turbulence means a bigger disturbance to radio signals. The researchers found that abnormalities above the Arctic polar cap are of a smaller scale – about 0.62 to 5 miles (1 to 8 kilometers) – than in the auroral region, where they are 0.62 to 25 miles (1 to 40 kilometers) in diameter. Why the difference? As Shume explains, the polar cap is connected to solar wind particles and electric fields in interplanetary space. On the other hand, the region of auroras is connected to the energetic particles in Earth’s magnetosphere, in which magnetic field lines close around Earth. These are crucial details that explain the different dynamics of the two regions. To look at irregularities in the ionosphere, researchers used data from the Canadian Space Agency satellite Cascade Smallsat and Ionospheric Polar Explorer (CASSIOPE), which launched in September 2013. The satellite covers the entire region of high latitudes, making it a useful tool for exploring the ionosphere. The data come from one of the instruments on CASSIOPE that looks at GPS signals as they skim the ionosphere. The instrument was conceived by researchers at the University of New Brunswick. The research has numerous applications. For instance, aircraft flying over the North Pole rely on solid communications with the ground; if they lose these signals, they may be required to change their flight paths, Mannucci said. Radio telescopes may also experience distortion from the ionosphere; understanding the effects could lead to more accurate measurements for astronomy. “It causes a lot of economic impact when these irregularities flare up and get bigger,” he said. NASA’s Deep Space Network, which tracks and communicates with spacecraft, is affected by the ionosphere. Komjathy and colleagues also work on mitigating and correcting for these distortions for the DSN. They can use GPS to measure the delay in signals caused by the ionosphere and then relay that information to spacecraft navigators who are using the DSN’s tracking data. “By understanding the magnitude of the interference, spacecraft navigators can subtract the distortion from the ionosphere to get more accurate spacecraft locations,” Mannucci said. Other authors on the study were Richard B. Langley of the Geodetic Research Laboratory, University of New Brunswick, Fredericton, New Brunswick, Canada; and Olga Verkhoglyadova and Mark D. Butala of JPL. Funding for the research came from NASA’s Science Mission Directorate in Washington. JPL, a division of the California Institute of Technology in Pasadena, manages the Deep Space Network for NASA. Be the first to comment on "Plasma Irregularities in the Polar Ionosphere Can Distort GPS Signals"